Consider the sort of cooking you intend to do in your oven. If you only want to cook pizza or small dishes, the Baby F60, Baby F75 or FVR 80 may be all you need – especially if you are limited by space. If you intend to use your oven for not just pizza, but also roasts, breads, large family feasts, then you should consider the FVR & TOP 100 or 120. These larger ovens have wider openings and also a larger cooking capacity. If temperature control is important to you, then our TOP Series, with its ceramic door and built in temperature gauge, is ideal. If you are limited by space, our Baby F60 or Baby F75 are perfect options. 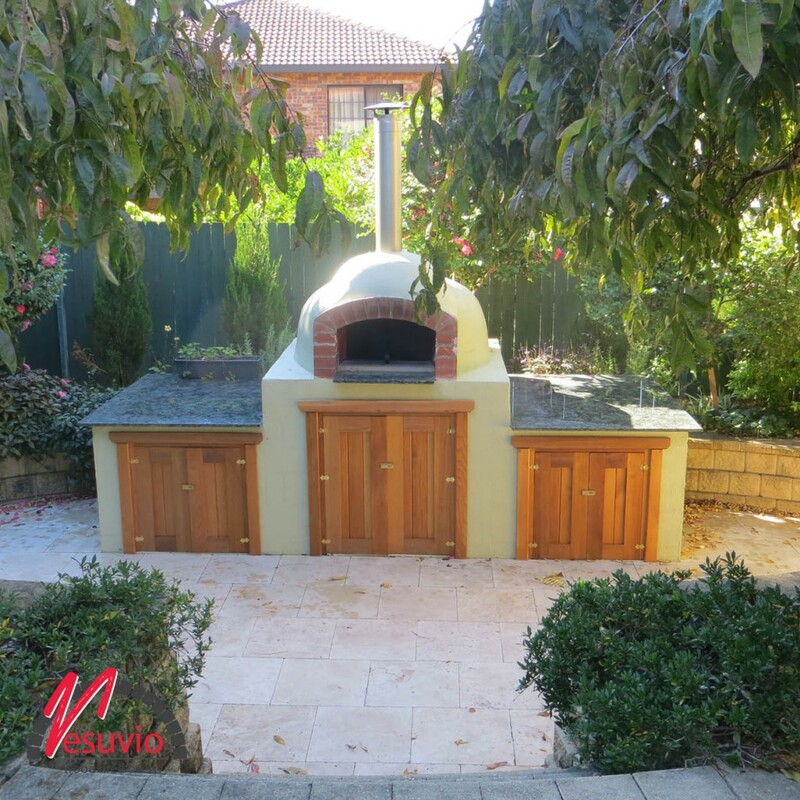 Needing only a maximum footprint of 1 x 1m, this wood fired oven is small enough to fit into a court yard or even on a balcony. If space is not an issue, then any of our wood fired ovens would be fine. All Vesuvio Wood Fired Ovens cooking floors are 100% made in Italy from “Cotto” clay from the hills of Tuscany … the way they have been made for over 65 years. Like most things, you get what you pay for and cheaper, inferior ovens may not be all they seem, and can contain hidden nasties such as asbestos in the cooking floor. Ensure the oven cooking floor is made from “cotto” clay and not concrete. Concrete ovens do not retain heat as well as a clay oven, which means you will use more fuel to keep temperature and produce good cooking results and they tend to crack. Vesuvio Wood Fired Ovens by Valoriani are built to last and as such come with a 3 year warranty. Naturally, people think wood fired ovens are for wood only. However, as people become more conscious about the environment and emissions, gas is being used more to fuel wood fired ovens. All Vesuvio Wood Fired Ovens by Valoriani can be used with wood or gas, or a combination of both. Gas is a cost effective and convenient way of to use your oven, with very low emissions. Rest assured however, when using the right wood and the oven to manufacturers guidelines, our ovens are in fact carbon neutral. Ensure the company you buy your oven from can provide expert after sales service. Can you call and ask advice on how to assemble and use your oven? Are the people selling you the oven passionate about their product and can they answer your questions? At Vesuvio Wood Fired Ovens, we have a team of professional and passionate people able to assist you with all aspects of your oven – from design, installation, and of course oven use. Having been in business for over 10 years and sold over 1,500 wood fired ovens, you can be sure you are dealing with professionals.